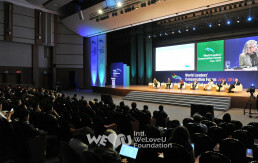 The 2nd World Leaders’ Conservation Forum was held at the Jeju International Convention Center from October 3 to 5 with the theme of “Cooperation for a Sustainable Future.” At this forum, jointly host by the Ministry of Environment, the Jeju Special Self-Governing Province, and the International Union for the Conservation of Nature [IUCN], world leaders discussed the sustainable use of natural resources, transnational environmental cooperation, and ways to strengthen the roles of future generations, making a collaborative effort. 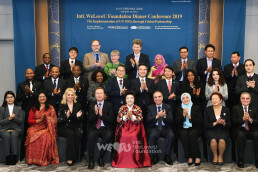 On October 3, 2018, Kim Joo-cheol, Vice-chairman of the Intl. 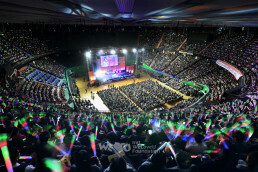 WeLoveU Foundation, was invited for a presentation at the “Green Talk Concert” that is for international NGOs. Speakers were domestic and global environmental group leaders; Inger Andersen the Director General of IUCN, Anna van Paddenburg the Deputy Director of Global Green Growth Institute [GGGI], Xavier Sticker the French Ambassador for the Environment, Shahbaz Khan the Regional Director (Asia and the Pacific) at UNESCO, Bruno Monteferri the Director of Conservamos por Naturaleza at the Peruvian Society for Environmental Law, Sohn Seong-hwan the Director of the World Wildlife Fund [WWF] Korea, and Ju Si-hu the Head of Green Campus Council in Gyeonggi-do, Korea. The event continued from 1 p.m. to 6 p.m. About 100 college students and citizens actively participated, listening carefully and asking questions. 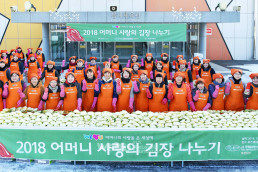 The presenters explained the actual state of environmental problems and the current situation of environmental movement, and asked the young generation to be more interested in environmental matters and to change the world by taking whatever action is necessary for that. 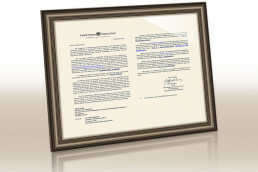 Kim Joo-cheol, Vice-chairman of the Intl. 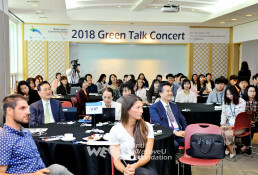 WeLoveU Foundation is making a speech at the “Green Talk Concert” of the 2018 World Leaders’ Conservation Forum. 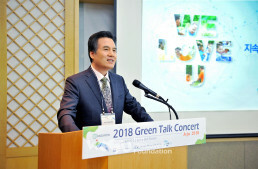 Domestic and global environmental group leaders, citizens, and college students at the Green Talk Concert—Bruno Monteferri the Director of Conservamos por Naturaleza at the Peruvian Society for Environmental Law, Sohn Seong-hwan the Director of the World Wildlife Fund [WWF] Korea, Marielza Oliveira the Director of UNESCO Beijing Cluster Office, Crista Valentino the Director of CoalitionWILD, and Kim Joo-cheol the Vice-chairman of the Intl. 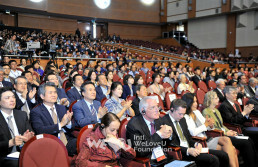 WeLoveU Foundation—are listening to the speech of another presenter.